(BENSON) Arizona G&T Cooperatives is playing a major role in establishment of a new primary care clinic in Benson that will provide regional health care services in an area suffering from a shortage of such facilities. The Benson Hospital Family Health Care clinic was made possible through a REDL&G (Rural Economic Development Loans & Grants program) loan, a program administered by AzGT. Clinic workers and Benson hospital staff cut the ribbon at the dedication of the new clinic Nov. 6. (l-r) Ora Goodman, Ken Goranson, Ann Cook, board chairperson, Nicklette Johnston, NP and clinic manager, Teresa Vincifora, Dr. Maysa Alvavi, and Amanda Osuna. The REDL&G loan program provides low-interest, long-term loans specifically for rural entities like hospitals that can’t obtain or afford conventional financing, which usually costs much more than REDL&G financing. The United States Department of Agriculture (USDA) provides the federal funds to AzGT for establishing the special revolving loan program. Ken Goranson, chief financial officer for Benson Hospital, said building the clinic would not have been possible without the REDL&G loan. “To a rural hospital it’s important because it allows us to get funding we need without having to go to financial institutions with the time and effort it takes to get a loan approved, and also just some of the criteria a traditional financial institution may have which can limit our ability to get funding,” Goranson said. 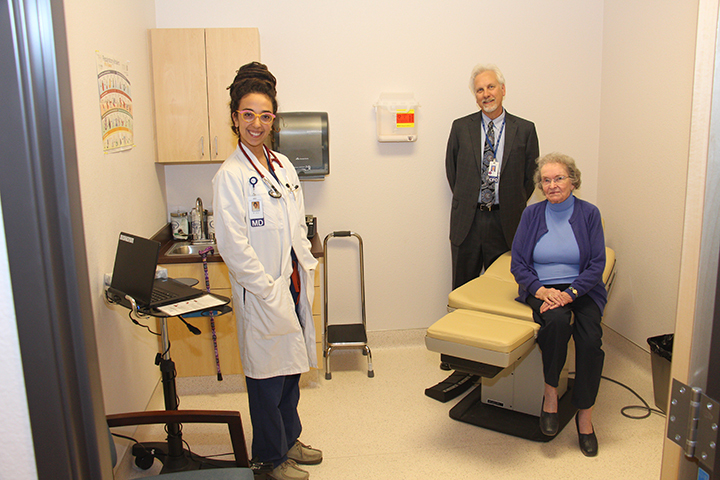 (l-r) Dr. Maysa Alvavi, Ken Goranson, and Ann Cook in one of the clinic exam rooms. “A loan like this gives us more opportunities to grow, with the lower rates and the longer terms,” Goranson said. 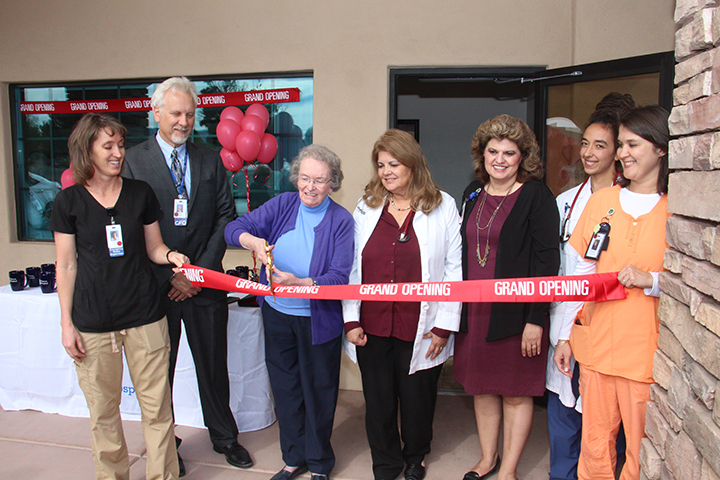 Benson Hospital Board Member Susan Willis, who is also president of the Southern Arizona Hospital Alliance, said the REDL&G program and AzGT’s role in administering the loan makes a “big difference” in providing health-care services. “In recognition that rural health care is under resourced for primary care, first and foremost, it’s essential that we have facilities where we can provide that care, and as this vision that came from the Benson Hospital was coming to fruition, you always have to say, ‘How are we going to pay for it?’ So this became a really helpful facilitator for us to get this up and running,” Willis said. “There’s no way to replace it, so without good primary care, chronic care management, all of those things, health care is far less efficient. Patients don’t get what they need, patients get sicker,” Willis said. Willis is also executive director for strategy at Tucson Medical Center. Teresa Vincifora, Benson Hospital chief clinical officer, called the clinic a “turning point” for the community. “We realized there was a need for primary care in this community. We’ve had a hard time getting primary care into the community, but we worked at it and were able to get nurse practitioners here, and we have also been able to bring in some physicians, so we’re really excited,” Vincifora said. Nicklette Johnston, Nurse Practitioner and Clinic Manager, is a Benson native who said the clinic is already seeing patients. “It’s very nice, we’ve had lots of patients coming in already. I have a lot of support from Benson Hospital, and a lot of people who back me up,” Johnston said. Willcox resident Jimmie Allsup drove to Benson as soon as he found out about the clinic. “I like the small atmosphere, being able to come in, seemed like you get more attention. I don’t go to the doctor often, but when I do, I really feel like I have something that warrants coming, and she was as concerned as I was. The service was excellent,” Allsup said.